Utility Cart. Perfect As A Microwave Stand. Bench Organizer. Size, 37x16x21.7H. Easy to assemble. 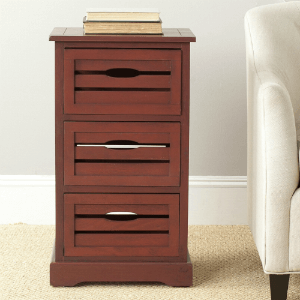 Monterey And Sonoma Collection Entryway Organizer. This Is The Perfect Solution In Any Entryway, Bedroom Or Mudroom Where There Is A Need For Storage. Two Divided Hanging Areas Provide A Wonderful Solution For Organizing Jackets, Coats, And Sweaters And The Single Drawer Is Great For Gloves, Socks, Hats And Scarves. The Top Shelf Is Divided And Perfect For Organizing School Supplies, Hats Or Shoes. Strong Construction. Easy To Assemble. Available In Three Colors: White, Black And Maple Finishes. Monterey Collection: White Finish.Sonoma Collection: Black And Maple Finishes. Size: 31 1/2 In. (W) x 16 In. (D) x 68 3/4 In. (H)Weight: 90lbs. See Related Items Below. 2-Tier Shelf. Easy To Assemble. Size: 47 x 11-2/3 x 28H..
Pencil Cup Box Size:6 x 6 x 7 1 LBS. Magazine/File Holder Box Size: 13 x 12 x 7 2 LBS. Wood File Box Box Size: 12.75 x 10.75 x 4 4 LBS.